White House officials have declined to specify the allegations under investigation. That raises questions among ethics experts about the extent of the probe and its credibility. It also contrasts to inquiries being conducted by Congress, EPA's inspector general and the Government Accountability Office. All of them have outlined the specifics of their probes. "They're not doing anything. It's so obvious," said Richard Painter, who was President George W. Bush's top ethics official. "He rented a condo for $50 per night from a lobbyist. He should be gone." The White House doesn't have an investigative arm like an inspector general, said Painter, who raised questions about the level of scrutiny Pruitt is receiving from the West Wing. Other bodies investigating the EPA chief said the White House hasn't been in contact. They include the EPA Office of Inspector General and the House Oversight and Government Reform Committee. Knowing the scope of the White House probe would ensure that it's not interfering with formal investigations by Congress and the IG's office, said Kathleen Clark, an ethics expert at Washington University in St. Louis. "The lack of transparency doesn't give one a lot of faith in whatever process they are using," she said. Mick Mulvaney, director of the White House Office of Management and Budget, confirmed that he's following up on a report by the GAO, which found that Pruitt violated federal law by ordering a $43,000 soundproof phone booth. Political appointees are required to clear purchases over $5,000 for office improvements with lawmakers (E&E News PM, April 18). 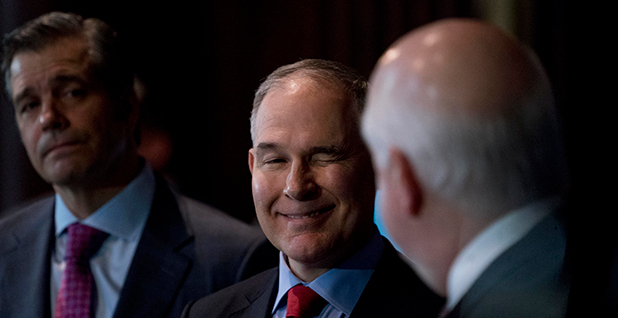 The Wall Street Journal also reported earlier this month that the White House was looking into the rental arrangement Pruitt had with the wife of energy lobbyist Steven Hart. Days later, on April 7, Trump tweeted his support for Pruitt, mentioning the EPA head paid "about market rate." Other information is trickling out. Emails obtained last week revealed that Hart met with Pruitt in July and public documents showed Hart lobbied EPA on behalf of clients, contradicting claims by Hart and Pruitt (E&E Daily, April 23). White House press secretary Sarah Huckabee Sanders said Monday that the White House "continues to review a number of the reports," without saying which ones. When asked for clarification, the White House told E&E News it had nothing to add to Sanders' comments. Meanwhile, Pruitt seems to be under intensifying pressure to avoid further controversy. Bloomberg reported that White House officials are telling congressional Republicans to temper their public defense of the EPA chief. How he performs during twin hearings in the House tomorrow could factor into his fate, too. The Daily Beast reported yesterday that EPA declined White House offers to help prepare for those hearings, underscoring the tension between the agency and the West Wing. Even congressional Republicans, who largely support Pruitt's efforts to reduce regulations on industry and agriculture, have grown increasingly frustrated with the EPA leader (E&E Daily, April 24). "He's in serious trouble," an administration official said yesterday. "I think it's just a matter of when, not if." Pruitt's defenders accuse liberals of targeting him. They've likened the stream of news stories to a smear campaign, due to his effectiveness in executing Trump's agenda (Climatewire, April 16). Still, Pruitt is catching heat for missteps apart from the condo and phone booth. A former EPA official documented numerous instances of wasteful and questionable spending on first-class flights, mixing personal with business travel, an expansion of his security detail and reassigning staff members who raised objections. The OMB inquiry into the cost of the phone booth, for its part, is required by law. Mulvaney must deliver a report to Congress and to the president because Pruitt violated the Antideficiency Act, said Scott Amey, general counsel with the watchdog group Project on Government Oversight. "I'll guess that OMB will investigate and an EPA official will be held accountable," he said in an email. "Only time will tell if that will be Pruitt or another agency official." Clark of Washington University said a White House investigation of a Cabinet-level member is "unusual," though not unprecedented. She pointed to the high-profile case of President Clinton's Agriculture Secretary Mike Espy, who resigned after being accused of accepting sports tickets, flights and lodging from poultry producer Tyson Foods Inc., which his department regulated. The Clinton White House acknowledged that it was investigating those allegations. The Trump White House hasn't taken that step. That's what concerns ethics experts. "Refusing to provide details about the scope of the review is not normal," Norman Eisen, the ethics czar to President Obama, said in an email. "This White House has a history of brushing aside legal violations, like Kellyanne Conway's three ethics or Hatch Act transgressions. The failure to answer questions about what is being looked at is further evidence that another White House whitewash is coming."